Well signed from the main road with easy access. 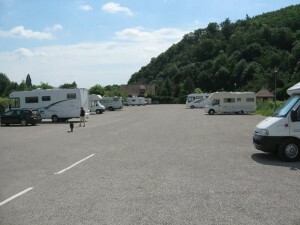 Large tarmac area with toilets and two service points. Overflow area available in bus parking area at night. Town centre within 200mtrs. Toilets locked each evening at 20:00hrs until 08:00hrs. Attractions Nearby: Kaysersberg is a very traditional Alsace town. Numerous cycle tracks into nearby villages. Castle on hill open and free entry. Stork nests on roof and Albert Schwitzer house and museum. Several Boulangeries and even more wine cellars. Good centre for exploring Alsace area.